… and let go of the fruits. What is love calling forth from you? The Gift is indestructible. It is a seed. We are not required to be God. We are not required to create the seed. Only to plant it wisely and well. You carry a gift in you – your gift – your seed, your medicine for the world, your gift to humankind. How relieving to recognize that we don’t have to make it, this gift of ours! It is here, it has always been here. Rather, our task it to tend the seed, to nourish it with water, sun, and love, and to cultivate it by trusting it. Cultivating the seed and later the sprout is a metaphor for taking consistent decisions that sustain our gift and our dharma. Once we “know” our dharma cognitively, emotionally, and intuitively, this life purpose acts as a lighthouse for us. Decisions that we take throughout our life can either lead towards the dharma lighthouse or in a different direction. Nobody forces us to take all our decisions towards the lighthouse, but… Individuals who consistently take choices in favor of their dharma, experience tremendous support by the whole universe. Will you tend your sprout, even when snow falls again? Or do you loose trust: “Oh, it’s doomed. The cold snow will destroy it.” How deeply do you trust your seed, your sprout, your gift, your dharma? 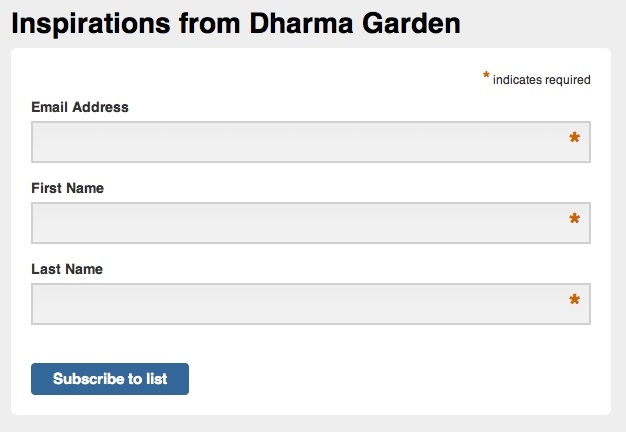 Take an inquiry of your daily decisions whether they lead towards the dharma lighthouse or not. You’ll find the size of your trust. It’s never too late to return to your seed or sprout and tend it with the love in your heart. There are days when I “see” that literally everything is made out of Love. For win-win-situations this is easy to see. And there are cases when Love takes an ugly, dirty, scary mask. But behind this mask Love is at work. The fundamental Love holding the whole universe is not always pink, glittery, shiny, and radiant – as we often anticipate that an enlightened state of being would look like. Love can be found in the messy, contracted, and even hard life. So when I start doubting this fundamental Love and its existence, I take a step out, I lean back for a few moments. I focus on how could Love make itself visible in this very situation? What or whom does this person love – what could be the motivation for her or his behavior? The art is to stay as open as possible regarding the answers. It could be love for oneself. It could be love for one’s child. It could be love for power. It could be love for one’s dead grandparents. It could be love for money. It could be love for disregarded groups of our society. It could be love for one’s own life. It could be love for an abstract principle. It could be love for a good life. It could be love for the orang-utans in the rainforest. It could be love for music. It could be love for something completely different. The second ingredient of art is to refrain from judging this motivation, instead to stay focussed on Love: see Love working through us, watch how Love manifests itself here and there, again and again, everywhere and always. The art is to keep our eyes on Love. What an amazing spiritual practice it is to witness Love at work expressing itself as Life.